Progress M-13M will deliver about 2.6 t of cargo to the orbital outpost, including propellant, oxygen, food, scientific equipment, additional hardware for ISS RS and USOS, and private deliveries for the crew. be deployed into orbit during a series of post-undocking maneouvres of Progress M-13M few months later. This is going to be the "Return to flight" launch for a Progress after disastrous Progress M-12M's launch. Microsatellite Chibis-M is a small spacecraft for studying new physical mechanisms in atmospheric lightning discharges. Its total mass is 40 kg, overall dimensions in the working position are 1100x1350x1805 mm (with deployed structural elements). 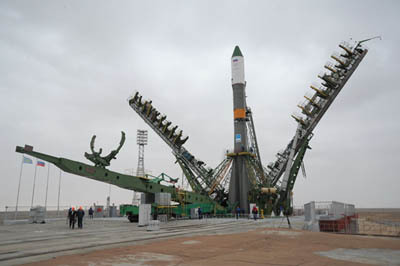 The microsatellite is to be delivered into the working orbit with an altitude of 480-500 km inside Progress M cargo transportation spacecraft to be subsequently operated in free flight for no less than 1 year. The launch of the MS will make it possible to conduct scientific research in atmospheric lighting discharges and magnetic wave phenomena; to verify the microsatelite orbital insertion system using Progress M spacecraft, the operation of the MS systems and ground control systems; to implement educational programs with young specialists and students. The MS was built by a team from the Special Design Bureau of the Institute for Space Research of the Russian Academy of Sciences. When I saw "Chibis", I thought of chibi. It actually means "a lapwing", a name for a bird, in Russian. Liftoff of Soyuz-U carrying Progress 45! Last edited by MattBaker; 10-30-2011 at 10:22 AM. Here comes the Korolev's cross... now in second stage flight. Progress has successfully reached orbit, separated from the 3rd stage and deployed! How did the solar panels deploy so quickly, though? Spacecraft separation! Can I say "Phew!" ? They aren't very big. My congratulation on the success! Since now, Progress launches are better to grab little notice, as they had always been doing. Last edited by Orbinaut Pete; 10-30-2011 at 10:42 AM. Here's calendar event for docking.